Many people have been displaying a preference for all natural products recently, so it’s no surprise that the all-natural movement would find its way to the world of mattress sales. 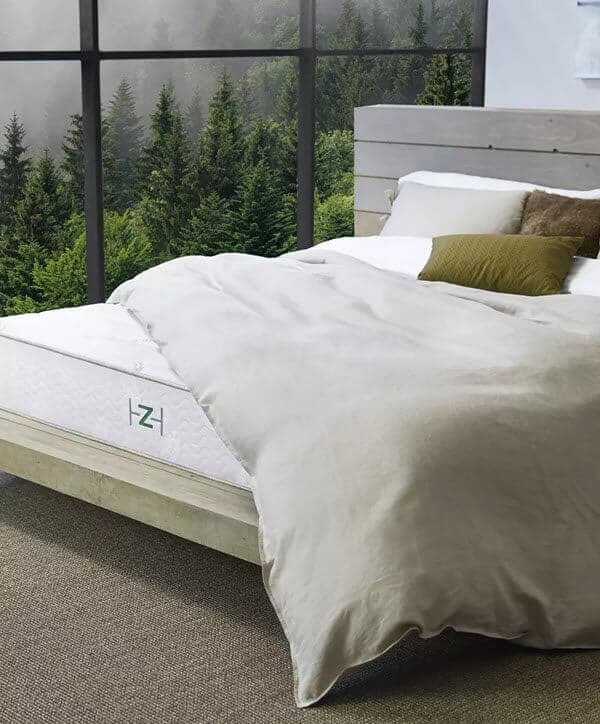 Zenhaven is an all-natural all latex mattress made by online mattress retailer Saatva. Saatva’s been in business for awhile, so they’ve got some credibility and name recognition when it comes to mattress manufacturing. Let’s see if they can deliver with an all-natural 100% Latex product, the Zenhaven. Keep reading for our full review. Should I Buy the Zenhaven Mattress? 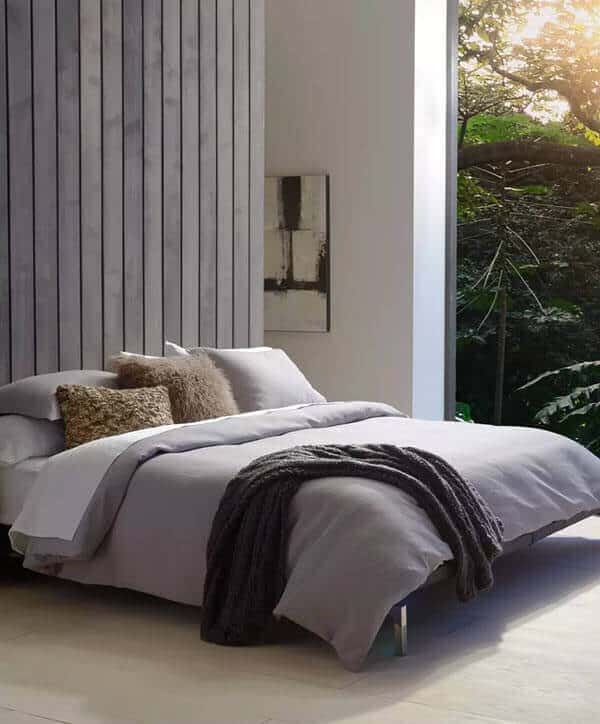 The Zenhaven mattress is made from four layers of 100% natural latex products. It is designed with the average sleeper in mind and is flippable to expand its usable life and to help maintain the properties that help make the mattress comfortable. It’s rare to find a layered foam mattress that’s flippable, as most mattresses rely on a thick foundational layer that sleepers would not want to lay directly on. Top – the top layer is designed for comfort. It is made from 1.5” of Talalay latex. It incorporates a 5 zone comfort layer to afford the mattress a more comfortable and supportive sleeping surface while helping to keep the mattress cool. This can be a boon to hot sleepers, as latex is also a naturally cool material with great responsiveness and bounce. Second – the second layer is made from 3” of Talalay latex. It is engineered for support. Placing a thicker level of a higher density latex material under the top layer offers pressure relief and support for most sleepers and sleeping positions. Third – the third layer of the Zenhaven is made from 3” of Talalay latex. This layer really shines when you take into account the flippable nature of the mattress. When the first layer is on top it acts as a transitional support medium. But when the mattress is flipped and this layer becomes the second layer it acts to provide more push back, offering support and firmness with the bottom (top when flipped) layer. Bottom – the last layer is made from 1.5” of Talalay latex. It provides support for the layers above it when it’s the bottom layer, and when the mattress is flipped it acts as a comfort layer but with a firmer feel. As you can see, the layout of the Zenhaven mattress is symmetrical to support its ability to be flipped. One side offers a softer sleeping surface, which we’ve labeled as the top here, and the other side, which we have as the bottom, will offer a firmer surface for sleeping. It’s impressive that Zenhaven was able to get these two different feels into one mattress. The Zenhaven cover is made from organic cotton. The cover also has a layer of Joma wool sewn into the interior lining. Joma wool is a very special material that helps with temperature regulation by absorbing moisture from the body and the air. There is a layer of Joma on each side of the mattress, so you’ll be able to enjoy the qualities Joma offers no matter which side you prefer to sleep on. The cover itself has a nice look to it, and the all white nature of the cover departs from the standard white on grey theme you see with most foam and online mattress retailers today. The organic cotton used gives the mattress a soft feel, but doesn’t interfere with the support offered by the mattress itself. The Joma wool is anti-microbial, hypoallergenic, and resistant to pests like dust mites. The Zenhaven is one of only a few mattresses that uses an all latex construction. Most latex mattresses are hybrids or use some latex in their construction. Making an all latex mattress is a bit of a tall order because of the need to balance the different qualities of the material with the attributes you are looking for in a good mattress for the general public. Saatva did a good job when it comes to balancing the sinkage and pressure relief of the mattress. The Zenhaven still gives a hug and contour, but it’s a different hug and contour than you’d typically get with a memory foam mattress. Latex produces a more rounded contour, which means that you don’t get a well defined hug around your body’s outline. Instead you get a contour around your body. This makes it ideal for those who want some sinkage and hug but do not like feeling like the mattress is trying to swallow them. The Zenhaven also offers good support. We found that it was able to provide the support needed for side, back, and stomach sleepers, and it did a good job of keeping the spine aligned. Some of the support comes from the 5 zone system used on the mattress, which offers more support in the areas where you need it, and less support in areas where you don’t need it. The Zenhaven also takes full advantage of the Joma wool and cooling properties of latex. It provides a very cool sleeping surface. 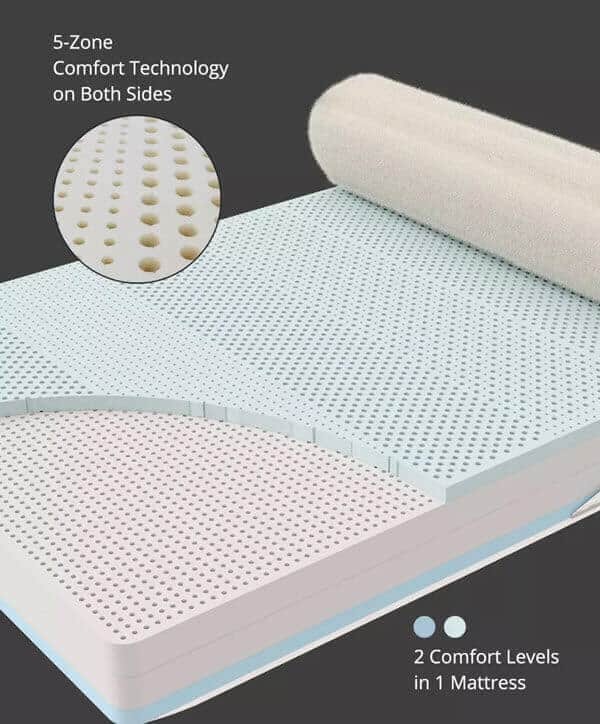 The layers are aerated which further adds to the cooling abilities of this mattress. One of the most appealing things about latex mattresses is the level of bounce they provide. This can let couples have more fun during adult playtime in bed. It’s hard to find a good bounce in a foam mattress, and Zenhaven provides a rare opportunity to get the hug and contour of foam with a bounce that comes close to that of a traditional mattress. Even though it has a good bounce, the Zenhaven doesn’t have problems with motion transfer. The movements spread out very quickly and so can’t be noticed by a partner in bed. This makes it a great option for light sleepers and those who can be disturbed by partners getting into or out of bed at night or that toss and turn in their sleep. We do sinkage tests on all of the mattresses we review. Sinkage tests also give you a better idea of how the mattress will perform in real life conditions, and give you a better idea of what it will be like to sleep on the mattress in different positions. Our tests are conducted by an individual who weights ~140lbs, so your results might be a bit different. Laying on Back – laying on the back in a normal sleeping position created 2” of sinkage on the plush side and 1.5” of sinkage on the firm side. Laying on Side — laying on the side in a normal sleeping position created 2.5” of sinkage on the plush side and 2” of sinkage on the firm side. Slight Edge Sit – sitting on the edge but to putting the full body weight on it caused 3.5” of sinkage on the plush side and 3” of sinkage on the firm side. Full Edge Sit – sitting on the edge with the body’s full weight caused 4.5” of sinkage on the plush side and 4” of sinkage on the firm side. Standing in Middle – standing in the middle with both feet flat caused 5” of sinkage on the plush side and 4.5” of sinkage on the firm side. Shipping – The Zenhaven mattress costs $99 for full service delivery, and shows up at your door in 9-18 days. Trial – 120 nights. This is longer than the average trial period offered by companies today. The Zenhaven mattress by Saatva is a good option for many different people. Those looking for a soft or medium firm feel will enjoy the way this mattress supports them. Many will also enjoy the fact that you can flip the mattress, meaning that if you’re having back or neck problems you can adjust the firmness of the mattress to compensate without having to get a new mattress or always have a firmer mattress. Those looking for a 100% mattress will also enjoy the Zenhaven. The latex used in its construction is all natural, as is the organic cotton and the Joma wool that can be found in the cover. This all natural approach is fairly novel for mattresses, and we’re excited to see if it is a trend that is going to continue down the road. The Zenhaven is also a good choice for those looking for an innovative mattress from a known company. The mattress is made by Saatva, and they’ve been making mattress for more than 5 years, becoming one of the best known names in the industry. As you can see, the Zenhaven mattress is appealing to many different kinds of sleepers. It does a good job providing the support, comfort, and cooling that most people look for in a mattress, while also providing great bounce and a unique hug and contour that you can only get with latex. While it is a bit more expensive than some of the foam mattresses that are available today, it’s in line with what you would expect an all natural luxury mattress to cost, so if you can afford it, the mattress will provide good value for money.